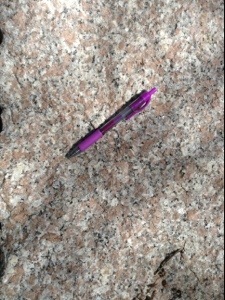 Halibut Point Quarry, Cape Ann Granite, type locality of annite, the Fe end-member of the biotite solid solution series (phlogopite being the Mg end-member), if I’m not mistaken. The UW-Madison Unstable Isotope Lab used zircon from in or near this quarry as an internal lab U/Pb standard for Paleozoic age determinations when I was a grad student there. As usual, Ron is right 🙂 The type locality for annite, though is not up in the Halibut Point quarry, but down along the ocean further to the east.